After the National Bureau of Statistics of Great Britain presented today very encouraging data from the UK labor market, the pound strengthened in the foreign exchange market. According to the data provided, for the period March-May unemployment fell to 4.5%, the lowest level since 1975, while the number of unemployed fell by 64,000, and the number of workers reached a record high. The average salary (excluding premiums) in March-May increased by 2% (with the forecast for growth of 1.8%). However, real wages in the UK remain, nevertheless, at a low level, as consumer prices grew faster than wages. In May, inflation was 2.9%, demonstrating the fastest growth rates in almost four years. The decline in the British pound on the outcome of the referendum on Brexit provoked an increase in import prices and spurred inflation. At a meeting of the Bank of England in June, three of the eight members of the Bank of England's Monetary Policy Committee voted to tighten monetary policy. The Bank of England Governor Mark Carney also signaled the likelihood of policy tightening in the future. However, for this, according to Karni, requires a strong growth of companies' investments, which can neutralize the slowdown in the pace of consumer spending. But there is another opinion on the tightening of monetary policy in the UK. So, today the Deputy Governor of the Bank of England Ben Broadbent said that, given the uncertainty of the economic outlook, "at the moment it is not worth making a decision (regarding raising rates)", and "there are many factors that can not be accurately assessed". This week, market participants will closely follow the speech (Wednesday and Thursday 14:00 (GMT)) of the Fed Chairman Janet Yellen. It is likely that in her report before the US Congress she will confirm the Fed's intention to tighten monetary and credit policy. In this case, the strengthening of the US dollar will resume. Also today, from 14:00 (GMT), volatility in the foreign exchange market could rise sharply due to the publication of the Bank of Canada's interest rate decision, which must be taken into account when making trading decisions. After the publication of data on the UK labor market, the pair GBP / USD rebounded from the key support level 1.2810 (EMA200 on the daily chart) and is currently trading above support level 1.2850 (EMA200 on the 4-hour chart). However, the positive momentum may not be enough to restore the positive dynamics of the pair GBP / USD. Indicators OsMA and Stochastics on the daily chart turned to short positions, signaling the continuation of the downward dynamics. The support levels of 1.2850, 1.2810 are good deterrent levels from the further decline of the GBP / USD pair. In case of breakdown of the support level 1.2745 (EMA144 on the daily chart), the GBP / USD decline will accelerate to targets near the levels of 1.2590 (June lows and the lower limit of the uplink on the weekly chart), 1.2365, 1.2110. If the positive dynamics of the pound returns, then the GBP / USD pair will resume growth with targets of 1.2980, 1.3050 (May highs), 1.3100, 1.3210 (Fibonacci level 23.6% correction to the pair GBP / USD decline in the wave, which began in July 2014 Near the level of 1.7200 and the upper limit of the rising channel on the weekly chart). Today, the pair AUD / USD again approached the annual highs of 4-month old near the 0.7745 mark. The Australian currency is growing, receiving double support from strong data on China's foreign trade balance and after the publication of the consumer price inflation indicator in Australia. According to data presented today (04:00 GMT + 3) by the Melbourne Institute, expectations for consumer price inflation rose 4.4% in July (the previous value + 3.6%). The high value of the indicator is positive for AUD. A little later (05:00 GMT + 3) came out strong indicators on China's trade balance. According to the data provided, exports in June increased (for the fourth consecutive month) by 11.3% compared to the same period of the previous year after an increase of 8.7% in May. The annual import growth in June was 17.2% after the growth of 14.8% in May (the forecast was + 12.4% compared to the same period of the previous year). China's foreign trade surplus rose to $ 42.77 billion in June from $ 40.81 billion in May, with a forecast of $ 44.2 billion; By about 5%. China is the largest trade and economic partner and buyer of primary commodities in Australia. Iron ore and coking coal account for about 30% and 12% of Australia's commodity exports, respectively. And most of the Australian raw materials exports are directed to China. Therefore, strong macroeconomic indicators from China have a positive impact on the quotes of the Australian currency. At the same time, the AUD / USD pair is growing on the weakening of the US dollar after yesterday, Fed Chairman Janet Yellen in his report in the US Congress confirmed plans for a "gradual" increase in interest rates. However, in her opinion, it is necessary to adhere to the gradual way of raising interest rates in the next few years. Today, Janet Yellen speaks to the US Senate Banking Committee. Investors are mostly skeptical about further tightening of monetary policy in the US against the backdrop of a slowdown in inflation. It is likely that today Janet Yellen will not say anything new. Market participants are ready for the December rate increase in the US, but will closely follow the performance of Yellen. Any hints from Yellen about the possibility of raising the rate in September will cause a sharp increase in the US dollar. Janet Yellen's speech will begin at 17:00 (GMT + 3). At the beginning of today's European session, the pair AUD / USD is trading at the upper border of the rising channel on the daily chart, closely approaching the annual highs near the 0.7745 mark. The positive dynamics of the AUD / USD pair is maintained above the key support level of 0.7530 (EMA200, EMA144 on the daily chart). The targets for the AUD / USD pair in case of its further growth will be the levels of 0.7780 (EMA144 on the weekly chart), 0.7840 (the Fibonacci retracement level of 38.2% correction to the wave of decline from July 2014, the minimum wave is near 0.6830), 0.8000 (EMA200 On a weekly chart). Only in case of breakdown of short-term support levels of 0.7585 (EMA200 and the bottom line of the uplink on the 4-hour chart), 0.7635 (EMA200 on the 1-hour chart) can we speak about the return of the downward dynamics of the AUD / USD pair. 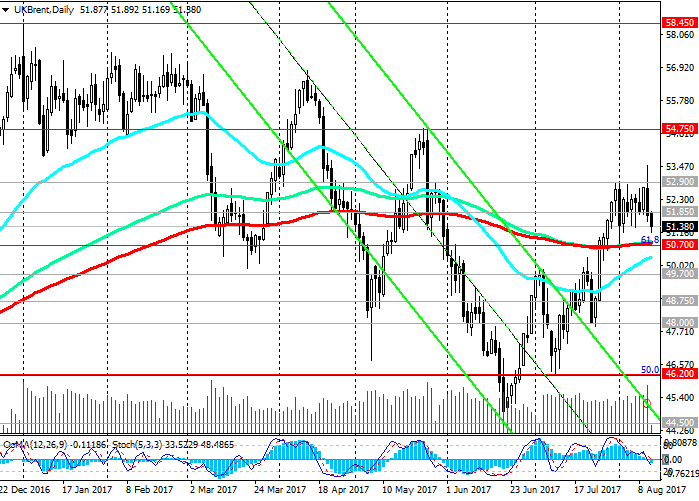 In the case of the development of the downward dynamics and breakdown of the key support level 0.7535 (EMA200, EMA144 on the daily chart), the bearish trend will again prevail in the dynamics of the AUD / USD pair. In this case, the targets will be the levels of 0.7460 (the Fibonacci level is 23.6% of the correction to the wave of the pair's decline since July 2014, the minimum wave is near 0.6830), 0.7420, 0.7375, 0.7330 (November and May lows). Today, the main US stock indexes are traded in a narrow range in anticipation of the publication of key US inflation indicators. Investors will also closely monitor the reporting of the largest US banks. Today begins the reporting period for US banks, including Citigroup Inc., J.P. Morgan Chase & Co., Wells Fargo & Co. and PNC Financial Services Inc.
Shares of American banks in the last three weeks gained almost 6% in the hope that a gradual increase in interest rates will lead to an increase in their income from lending. The Fed has planned another rate hike this year, but some investors are still skeptical about further tightening of monetary policy. Fed executives are calling for waiting for more robust signals about inflation in the US to continue raising interest rates in the US. This opinion was yesterday held by the President of the Federal Reserve Bank of Dallas Robert Kaplan, President of the Federal Reserve Bank of Minneapolis Neil Kashkari, a member of the Board of Governors of the Federal Reserve, Lael Brainard. In general, so far the positive dynamics of the indices against the backdrop of the growth of corporate profits remains. However, the rhetoric of the world's central banks has changed toward a more stringent monetary policy. It seems that, amid the strengthening of the world economy, stimulating programs in countries with the largest economies may soon be curtailed. And this is a negative factor for the stock markets. At (12:30 GMT) the US consumer price index and retail sales report are published. Investors will pay close attention to the data to understand whether the recent weakening of inflation is temporary. The reaction of the dollar and the US stock market to inflation data is acute, given that these data, along with data on the labor market and GDP, play a key role in the decision making by the Fed at the interest rate. It is expected that in June, the consumer price index (CPI) rose by 0.1% (after a decrease of 0.1% in May) and by 1.7% in annual terms. Such an increase in inflation will not satisfy the Fed and will help to weaken the US dollar, but will also support American stock markets. But if the consumer price index comes out in June with better indicators than the forecast, the dollar will strengthen in the foreign exchange market, while stock indices, including the S & P500 index, will decrease. With the opening of today's trading day, the S & P500 index slightly decreased, trading in a narrow range near the mark of 2445.0. The OsMA and Stochastic indicators on the daily chart are on the buyers side, however, on the 4-hour, 1-hour chart, the indicators turned to short positions, signaling an overdue correction after many days of growth. In the event of a downward correction, the S & P500 may fall to the support levels 2433.0 (EMA200 on the 1-hour chart), 2426.0 (EMA200 on the 4-hour chart and the bottom line of the uplink on the daily chart). The OsMA and Stochastic indicators on the weekly chart also turned to short positions. If the negative trend increases, then the deeper decline of the index to support levels of 2405.0 (June and July lows), 2390.0, 2355.0, near which the bottom line of the rising channel passes on the weekly chart, is possible. While the price is above 2325.0 (EMA200 on the daily chart), 2305.0 (Fibonacci level of 23.6% correction to growth since February 2016), the positive dynamics of the index remains. In the event of a breakdown of the resistance level 2452.0 (June and year highs), the growth of the index will resume. After Friday's weak data on retail sales and inflation in the US were published, the main US stock indexes rose. As the US Department of Labor reported on Friday, the consumer price index (CPI) remained unchanged in June compared to the previous month (0.0% in June, + 1.6% in annual terms, vs forecast +0.1% and +1.7%, respectively). Retail sales in June, according to the data presented, fell by 0.2% compared to May (sales were expected to increase by 0.1%). These data are key for the Fed in the matter of making an interest rate decision. Investors bought shares and bonds on Friday, as weak data on retail sales and inflation suggest that the Federal Reserve is unlikely to raise interest rates and reduce assets in the coming months. Against the background of purchases of 10-year US Treasury bonds, their profitability declined from 2.319% to 2.298% after the publication of macro data. The S & P500 index rose 0.5% on Friday to 2459.00 points. The Dow Jones Industrial Average index increased by 0.4% to 21637.00 points. Last week was the most successful for both indices from the end of May. So, S&P500 for the week gained 1.4%, and DJIA grew by 1%. On Friday, the reporting season for US banks began, the results were published by Citigroup Inc., J.P. Morgan Chase & Co., Wells Fargo & Co. and PNC Financial Services Inc. Hopes for high financial results of companies for the 2-nd quarter also support the US stock indexes. Shares of US banks over the past three weeks have risen in price. Also last week, shares of technology companies in the United States grew. The subindex of the technology sector of the S & P500 grew by 3.8%, showing the best weekly result in 2017. Now, after the publication of the data, the probability of an increase in the rate in December, according to the CME Group, fell below the level of 50%. President of the Federal Reserve Bank of Dallas Robert Kaplan on Thursday made it clear that he would like to wait for the acceleration of inflation before raising interest rates again. It is likely that the Fed in the future may be more prudent approach to raising rates. If the Fed again adheres to mild rhetoric regarding monetary policy, it will stimulate the US stock market to further growth. DJIA updated its annual highs on Friday and reached a new absolute maximum near the mark of 21680.0. The DJIA index continues to grow steadily, starting from February 2016 and trading in the ascending channels on the daily and weekly charts. So far, the index is trading above the key support level of 20300.0 (EMA200 on the daily chart, as well as the Fibonacci level of 23.6% correction to the growth in the wave from the level of 15660.0 after rebounding in February this year to the collapse of the markets since the beginning of the year. The maximum of this wave and the Fibonacci level 0% is near the mark of 21536.0), its medium-term positive dynamics is preserved. The long positions in the DJIA index trade are relevant. Against the background of low inflation in the US and the Fed's predilection, in connection with this, to a cautious approach in the matter of further interest rate hikes, the further growth of the DJIA index is likely. Only in case of breakdown of the support level of 21360.0 (EMA200 on the 4-hour chart) can we again return to consideration of short positions on the DJIA index. And only in case of breakdown of the support level of 19380.0 (Fibonacci level of 38.2%) can we speak about the breakdown of the bullish trend. The dollar continues to decline actively in the foreign exchange market. Nevertheless, on oil prices denominated in dollars, so far this fact is reflected little. Much more impact on oil prices had a storm in the US in the Houston area, a hurricane, later a "tropical storm", Harvey. Hurricane caused damage to oil refineries located in this part of the US, leading to their closure. Nearly 30% of the country's oil refining facilities are located on the Texas coast. Also, several offshore oil and gas platforms in the Gulf of Mexico were closed, accounting for about 22% of offshore oil production in the Gulf. Their closure will negatively affect oil demand in the US, and will also affect world oil prices. According to experts of the oil market, the negative impact of the consequences of the storm can drag on for several weeks, because it will take time to restart the refinery. Even yesterday, futures for Brent crude on ICE Futures fell 1.3% to 51.74 dollars per barrel. Today, oil prices continued to decline. The spot price for Brent crude at the beginning of today's European session was close to $ 51.00 per barrel. Wednesday (14:30 GMT) will publish weekly data of the Ministry of Energy on oil reserves in the US. Decrease in demand from the refinery will probably cause an increase in inventories, since oil produced earlier and domestically is not being processed. This can cause pressure on oil prices. Also today, it is worth paying attention to the weekly published data at 20:30 (GMT) on oil reserves from the American Petroleum Institute, which largely correlates with official data from the US Energy Ministry. The price of Brent oil broke through the short-term support level of 51.65 (EMA50 on the 4-hour chart, EMA200 on the 1-hour chart) and found support today at 50.95 (EMA200 on the 4-hour chart, EMA144 on the daily chart, EMA50 on the weekly chart). Short-term negative dynamics prevails. In case of breakdown of the support levels of 50.95, 50.70 (EMA50 on the weekly chart, as well as the Fibonacci level of 61.8% of the correction to the decline from the level of 65.30 from June 2015 to the absolute minimums of 2016 near the 27.00 mark), the decline may last to the support level of 50.00 (lows August). Further objectives are support levels 48.75, 48.00, 46.20 (50% Fibonacci level), 44.50 (year lows). A more distant goal is the level 41.70 (the Fibonacci level of 38.2% and the lower boundary of the descending channel on the weekly chart), which increases the risks of price return in the bearish trend. Indicators OsMA and Stochastics on the 4-hour, daily, weekly charts again moved to the side of sellers. In case of resumption of growth and breakdown of resistance level 52.20, the target will be 52.90 (EMA144 on the weekly chart), 53.40 (August highs), 54.70 (EMA200 on the weekly chart and the upper bound of the rising channel on the daily chart). The sharp increase in EUR / USD, observed from the beginning of the year and, especially, in recent days, is connected both with the weakening of the dollar and with the continuing purchases of the euro. Heads of the Fed and the ECB did not make any hints at the last conference in Jackson Hole about the timing of further interest rate hikes. Investors regarded this as the Fed's tendency to soft monetary policy and that the current euro rate is satisfied with the ECB leaders. Since the beginning of this year, the trade-weighted index of the euro has increased by more than 7%. This was the best result for the currency since its inception in 1999. The single European currency receives support and against the backdrop of strengthening the economy of the Eurozone, which is often mentioned by the head of the ECB Mario Draghi. Euro since the beginning of the year it has added more than 14% against the dollar. The pair EUR / USD has reached the maximum mark since January 2015. In the minutes of the July meeting of the ECB, there were "concerns about the rise in value (euro) in the future". Nevertheless, many economists believe that the ECB will begin to wind down the bond purchase program in December this year. The ECB simply does not have assets to buy. At the same time, the ECB is in a difficult situation, since inflation is below the target level of just under 2.0%. Still, the ECB is likely to have to roll back the stimulus even if the outlook for inflation worsens. In view of this, it is likely that the euro will continue to grow. Much will depend also on the pace at which the ECB will begin to reduce purchases of assets. Today we are waiting for the data from the USA. Starting at 12:15 (GMT) a number of important macroeconomic indicators will appear, including the report on employment from ADP for August, data on spending on personal consumption in the US for the second quarter, annual GDP for the second quarter. In this period, a surge in volatility is expected in trading in financial markets, including the EUR / USD pair, which should be taken into account when opening trade positions at this time. The GDP is expected to grow by 2.7% (against + 2.6% in the first quarter). If the forecast is justified, the dollar will receive support. Meanwhile, the prospect of further weakening of the USD and the growth of the EUR / USD pair remains. Despite the current corrective decline, the pair EUR / USD keeps positive dynamics, trading in the uplink on the daily chart. Yesterday EUR / USD set another 4-month record, reaching 1.2070 and returning to the levels of December 2014. If the growth resumes, the targets will be the levels of 1.2050 (low of July 2012), 1.2070, 1.2180 (the Fibonacci level of 50% of the corrective growth from the minimums reached in February 2015 in the last wave of global decline from 1.3900), 1.2370 (EMA200 on the monthly chart). You can return to consideration of short positions in case of EUR / USD return to support level 1.1780 (Fibonacci level 38.2%). The breakthrough of support level 1.1620 (EMA200 on the weekly chart) increases the risk of EUR / USD returning to a downward global trend. Strong macro data, received from the US at the beginning of today's US session, caused the growth of the main US stock indices. Nasdaq Composite climbed 18.00 points (0.30%), S & P500 rose 6.34 points (0.26%), DJIA started trading with an increase of 47.83 points (0.22%). Personal incomes of Americans in July increased by 0.4% (the forecast was + 0.3%), personal expenses (indicator, estimating household costs) in July, adjusted for seasonal fluctuations, increased by 0.3% (forecast was +0, 4%). The increase in income raises the Americans' confidence in the government and economy. Consumer spending accounts for the bulk of US GDP. Published on Thursday, the report showed that the annual growth in US GDP in the 2nd quarter of this year was 3%. Presented by the US Department of Commerce data indicate a positive momentum in the US economy in the second half of the year. However, the price index for personal consumption expenditure (RFE), the Fed's preferred inflation indicator, rose 0.1% in July from the previous month after a lack of growth in June and a drop of 0.1% in May. Compared to the same period last year, the index grew by 1.4%, which is below the target level of the Fed, which is 2%. Presented today by the US Department of Labor data indicate a steady increase in employment. Thus, the number of initial applications for unemployment benefits was 236,000 in the week of August 20-26. The number of primary applications has fluctuated historically in the past few years. They remain below 300,000 for 130 consecutive weeks, which is the longest period since 1970. As a percentage of labor, the indicator of layoffs is at the lowest level since the 1960s. Secondary applications for unemployment benefits fell by 12,000 to 1.942 million. The consistently low level of applications for unemployment benefits is one of the signs of a strong labor market, which is approaching the state of maximum employment. Against the backdrop of the data, US stock indexes rose. The growth of the indices continues, therefore, for the fourth trading session in a row, and for the seventh month in a row, which indicates the confidence of investors in the strength of the American economy. At the same time, the weakness of inflationary pressures in the US economy makes it more difficult for the Federal Reserve to raise short-term interest rates before the end of the year. Thus, the data presented today contribute to the further growth of the US stock market. It seems that the consequences of Hurricane Harvey, the geopolitical tensions associated with the terrorist attacks in Europe and the provocations with missile launches by North Korea are receding into the background. And, in general, the positive dynamics of the US stock market remains. Twice this month, pushing away from the support level of 2418.0 (the bottom line of the rising channel on the daily chart), the S & P500 index keeps positive dynamics and is traded in the uplink on the weekly chart. There is a possibility of further growth. The alternative scenario will be connected with the breakdown of the short-term support level 2450.0 (EMA200 on the 4-hour chart) and the continuation of the decline with the targets 2405.0 (June-July low and the lower limit of the uplink on the weekly chart), 2390.0 (March highs). The upward trend in the S & P500 index is maintained as long as it trades above the key support levels of 2365.0 (EMA200 on the daily chart), 2325.0 (Fibonacci level of 23.6% correction to growth since February 2016). About the reversal of the bullish trend is not yet talking. Major US stock indexes began the month with a slight increase. Investors are waiting for a monthly report on the US labor market, which will be published at 12:30 (GMT). This report is extremely important in assessing the prospects for the dollar and the US stock market, because it characterizes the stability of the US economy, the largest in the world. On Thursday, US stock indexes rose thanks to a series of positive macro data. According to a report published by the US Department of Commerce on Thursday, the costs and incomes of Americans grew quite rapidly in July. The index of prices for personal consumption expenditure (PCE) increased by 1.4% compared to the same period of the previous year. The income of Americans in July rose by 0.4% compared to June, which was the strongest growth since February. Americans have a large amount of cash for the next few months ahead, which could have a positive impact on GDP growth. Data from ADP for August, which characterize the level of employment in the private sector of the US economy, also came out better than the forecast, indicating that the labor market is approaching full employment. And at the same time, the US economy has a controversial situation: the growth of consumer spending in combination with the fall in unemployment indicates a fairly rapid and stable economic growth. However, inflation still remains slow, below the target level of the Fed in 2%. In the data block from the US labor market, investors are particularly interested in the wage growth indicator, which will be used to judge the prospects for monetary policy in the coming months. Although unemployment is low and job creation is stable, wages have been rising at a moderate pace for a long time. In view of the low inflation of space, the Federal Reserve has little to raise rates. According to futures on federal funds, which track the CME Group, investors estimate the probability of a rate hike by the end of December at 37%. And yet, the overall state of the US economy is encouraging, prompting investors to buy high-yielding high-risk assets. This is evidenced by the multi-month bullish trend of the US stock market. And, if today's publication of data from the US labor market is also positive, close to the forecast values, the US stock indexes will continue to grow. DJIA maintains positive dynamics and continues to grow in the uplink on the daily chart, striving for the level of 22177.0 (the highs of the year and August). Long positions are relevant. Only in case of breakdown of the important support levels 21800.0 (EMA200 on the 4-hour chart), 21700.0 (EMA50 and the bottom line of the ascending channel on the daily chart), we can return to consideration of short positions on the DJIA. Indicators OsMA and Stochastics on the 4-hour, daily charts are on the buyers side. In case of breakdown of the support level 21700.0, the target of the decrease may be support levels 20750.0 (EMA200 on the daily chart), 20630.0 (Fibonacci level of 23.6% correction to the wave growth from the level of 15660.0 after recovery in February this year to the collapse of the markets since the beginning of the year. The maximum of this wave, and the Fibonacci level of 0%, is near the mark of 22177.0). Levels 20750.0, 20630.0, thus, are key to long-term bullish trend of DJIA. The GDP growth in the UK this year has significantly slowed. Economic growth in the 1st and 2nd quarters was half that of the last three months of 2016. High inflation, exceeding the target level of the Bank of England, continues to reduce the disposable income of the British, which reduces domestic demand. The British economy, largely dependent on domestic consumption, grew by only 0.3% in the second quarter (+ 0.2% in the first quarter). In a situation of shrinking domestic demand, British companies will have to increase capital investment. The decline in consumer spending and the slowdown in the UK economy, which are taking place against the background of Brexit, will help the Bank of England continue to adhere to extra soft monetary policy. As you know, last summer the Bank of England lowered the interest rate to a record level of 0.25%, the lowest for the last 300 years. The slowdown in the UK economy, the protracted Brexit talks and the unclear prospects for the monetary policy of the UK central bank continue to have a negative impact on the pound quotes. It is likely that the pound will remain under pressure at the beginning of this week before the debate in parliament on Thursday. On Friday (11:30 GMT + 3), the National Statistical Office of Great Britain will publish July data on industrial production and manufacturing in the manufacturing industry, which will allow us to assess the state of the British economy at the beginning of the third quarter. It is expected that the data will come with almost zero growth, which will also negatively affect the quotes of the pound. Today, most of the US financial markets are closed due to the celebration of Labor Day. The low activity of traders and low trading volumes in the foreign exchange market are expected. The growth of volatility in the foreign exchange market will begin tomorrow, when during the Asian session (02:01 GMT + 3) the British Retail Consortium (BRC) will publish a report on retail sales for August, and at 07:30 (GMT + 3) the RBA will publish a decision on interest rate in Australia. Despite continued pressure on the pound, the pair GBP / USD remains positive, trading above support levels 1.2935 (EMA200 on the 4-hour chart, EMA50 on the daily chart), 1.2860 (EMA200 on the daily chart) in the uplink on the daily chart. Breakdown of the local resistance level 1.2980 will create the prerequisites for the recovery of the mid-term upward correction trend. The closest target in this case will be the resistance level 1.3210 (Fibonacci level 23.6% correction to the decline in the GBP / USD pair in the wave, which began in July 2014 near the level of 1.7200). Levels of 1.3300 (the upper limit of the channel on the weekly chart), 1.3460 (July and September highs) will be the next growth target. A fall below support level 1.2860 will strengthen the risk of GBP / USD returning to a downtrend. Indicators OsMA and Stochastics on the 4-hour, daily, weekly, monthly charts were deployed to short positions. After yesterday, marked by sluggish dynamics and low volumes, today we see an increase in volatility and the resumption of a decline in the US dollar. The continuing tension in the Asia-Pacific region continues to stimulate purchases of assets-shelters, such as gold, yen, and franc. There is also an increase in the prices of oil and other commodities, along with which the quotations of commodity currencies are growing. The New Zealand dollar is also growing today against the US dollar, despite a number of fundamental factors. This is the continuing commitment of the RBNZ to conducting soft monetary policy, the uncertainty surrounding the elections in New Zealand scheduled for September 23, geopolitical tensions in the region due to the continuing provocations by North Korea against the US and Japan. For a stable recovery in the New Zealand economy and rising inflation, "a lower New Zealand dollar rate is needed", the RBNZ said recently. We are waiting for today data from the auction of dairy products, the publication of which is scheduled for the period after 14:00 (GMT). The price index for dairy products, prepared by Global Dairy Trade, came out last time with a value of -0.4%. If the prices for milk powder decrease again, it will have a negative impact on the New Zealand dollar. Today, NZD / USD is trading in the range between support levels of 0.7165 (EMA200), 0.7190 (EMA144 on the daily chart). A breakthrough in one direction or another may determine the direction of further medium-term movement of the NZD / USD pair. The fastening above the levels of 0.7240 (the Fibonacci level of 38.2% of the upward correction to the global wave of decline of the pair from the level of 0.8800, which began in July 2014, the minimums of December 2016), 0.7270 (EMA200 on 4-hour, weekly charts) will confirm the return of the upward dynamics. In the alternative scenario and in case of a breakdown of the level 0.7165, a further decline to the support levels 0.6860 (Fibonacci level of 23.6% and the lower limit of the range located between the levels of 0.7550 and 0.6860) is possible. A break at the level of 0.6860 will mean the end of the upward correction, which began in September 2015, and a return to the downward trend. Indicators OsMA and Stochastics on the daily, weekly charts recommend short positions.